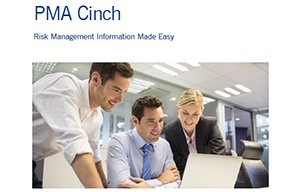 PMA Cinch is a sophisticated Risk Management Information System (RMIS) that is easy and convenient to use. It offers Risk Management executives, CFOs, and other professionals a strategic approach to risk management with comprehensive claims and loss information, as well as data analytics at your fingertips. The robust capabilities and flexibility of PMA Cinch allow clients to pinpoint the information that can significantly impact their bottom line. By analyzing trends and taking quicker corrective action, organizations can enhance their operating performance, lower costs, and improve their financial results. Need help logging into or registering for Cinch?